BMG LABTECH is making a binder stuffed full of application notes on its microplate readers available to LabHomepage readers. The company says that having a “perfectly engineered microplate reader” is of little uise if the operator doesn’t know how to get the best from it. 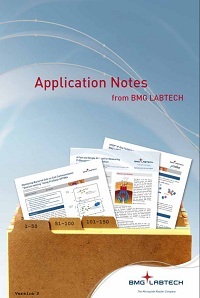 The notes included in this Application Notes Binder were all written from the experiences of a variety of experiements performed on the company’s range of microplate readers. Among these are Adme and toxicology studies, cell based assays, DNA and protein quantification, drug solubility, Elisa and EIA, enzyme activity and kinetic assays, genotyping, molecular binding assays, protein-protein interactions, receptor-ligand binding, reporter gene assays, and second messenger signalling. For those who prefer to work online, BMG Labtech’s online searchable applications database offers nearly 3000 application notes, peer-reviewed articles, and scientific posters about its microplate readers.